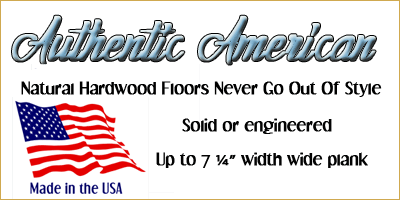 Today, many prefinished hardwood floors come in a variety of finishes with aluminum oxide. Earlier versions of the finish saw applications on the top surface, but complaints of roughness moved manufacturers to a sandwich type application where the aluminum oxide was applied more to the center layers of the finishing process. How To Refinish or Rejuvenate These Finishes? Over the years I received many calls with an increasing frequency about failures regarding buff/screen and re-coating floors with aluminum oxide finishes. Some people in our industry like to use the same methods and techniques that have been tried and tested true. Over time, as with all things, change comes. Today's finishes are the result of the laboratory sciences, evolving into quite amazing products. One word - Bonding. By just buffing/screening, vacuuming, tack-ragging the floors, and coating; in many cases the finishes are not bonding to the aluminum oxide finish. The result is that the new finish peels off, either in patches or large sheets. As you might imagine, having this happen as a flooring contractor is not going to result in getting paid for all of your hard work. As a homeowner, you are going to be left in a bad spot at best. 1. Check for contamination of the existing finish. I fully realize you probably won't be sending samples out to a lab for a full chemical analysis, or have a spectrometer laying around in your basement. I recommend you find some out of the way place which would receive the same treatment as the rest of your flooring and scrape some of the old finish to see if there is any noticeable build up of wax, oil, or other contaminants. You can scrape with the edge of a coin, or what not. If there is any indication of contamination, the floors will have to be fully sanded, and refinished. Another method of checking for contamination would be to use a terry cloth rag with some mineral spirits, and rub a small area vigorously. If there is a visible residue left on the rag. Sanding and refinishing will be required. If you decide to do otherwise, you are likely wasting your time and money. 2. Clean the floors the best you can. Sweep and vacuum. 3. 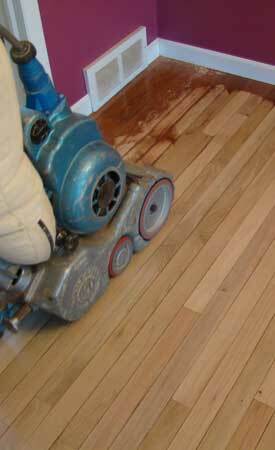 Apply The Bona Spray over about a 30 square foot area, and buff with 2 layers of Bona prep pads under a standard 175 rpm floor buffer. 4. 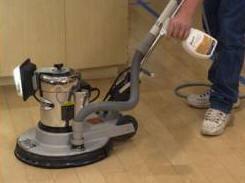 Promptly tack-rag- the floors with a rag, micro-fiber / terry-cloth mop head soaked, and wrung out with the BONA spray. 5. Buff the floor again (second time) with before mentioned 175 rpm buffer and Bona prep pads just to make sure the floors will be truly clean and well abraded. AREAS THE BUFFER MACHINE WON'T REACH MUST BE DONE BY HAND. 6. Repeat Step 4. This will help insure full coverage of the prep spray, therefore a good bonding surface for your new finish. 7. When the liquid is dry - apply Bona Sport, Bona Traffic, or Pacific Strong floor finish as directed. I recommend visiting the Bona Kemi site and watching their video or calling their tech support line, as I have only covered the basic information here. The tech support people at Bona Kemi are wonderful, as they fully realize their most satisfied customers are the well informed customers. They are happy to provide you with any information you may need. Basic Coatings also has a product named Tycote that can be used with aluminium oxide type floors. View the video below that basically follows what was mentioned in the Bona Kemi recommendations above. For those with floors that are beyond the recoat system mentioned above total refinishing of these floor types can be troublesome. Considering aluminium oxide finishes are also relatively new, you'll find some contractors that have no experience refinishing them. Those that do have experience are likely to charge a dollar and more per square foot due to the time and aggravation involved. Not only is it more time consuming but often higher priced and more effective sanding paper is used. There's much debate in how these floors are refinished and can depend on the actual age of the finish. Older original aluminium oxide floors dating pre 2000 were manufactured differently or better described as having a heavier application. As time moved forward these applications were reduced. Essentially the older floors are going to take longer and cost more to refinish. Some professionals simply start with 20 grit standard paper, while others at 36 or 40 grit but apply more pressure to the machine. Then they work with progressively higher grits with subsequent passes over the floor. Others have had success beginning with higher grits and one pass to scarify the aluminum oxide, claiming the subsequent lower grit sanding is easier after the initial application. There is an unknown in what effect aluminum oxide sanding dust actually does to ones health. Only time will tell, but from my standpoint any protection should be used.